For the second year in a row, Cocktails in the City came in for the weekend and swept the Hoodooist’s life into a tizzy. CitC’s Summer Edition brought 25 bars representing several spirit brands together under the sunny skies at Bedford Square Gardens where 2,000 Londoners came down over 2 days to try a whopping 7,724 cocktails! 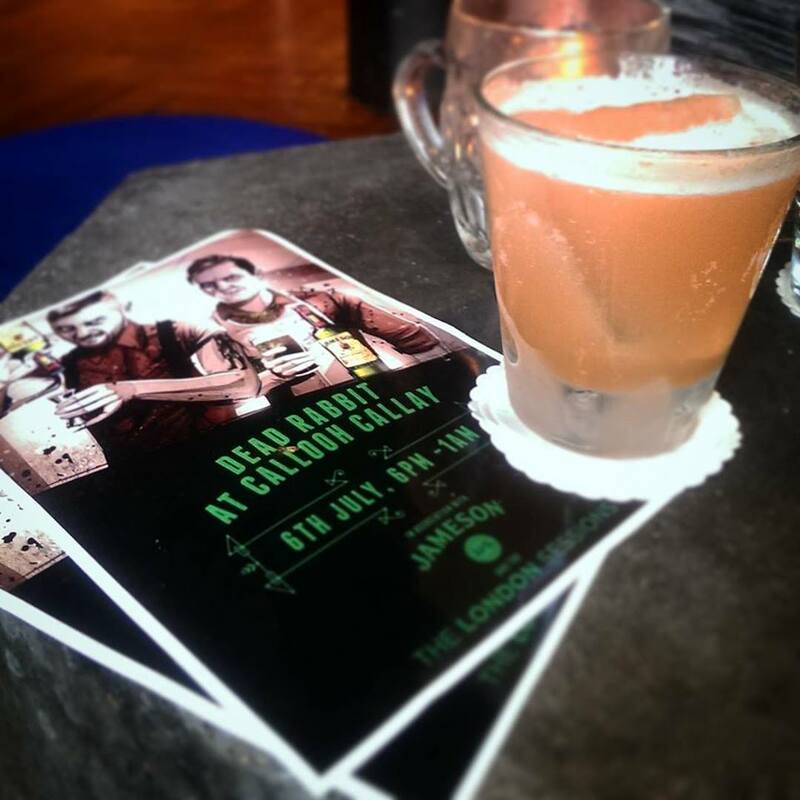 Here, we’re gonna look at the cocktails that impressed the Hoodooist most, as well as the best present stalls and experiences. The Reverend JW Simpson (Click HERE for Review!) presented 4 seperate cocktails, but their star was the Reverse Vesper : Lillet Blanc Vermouth, Belvedere Vodka, a touch of grapefruit and gin at a ratio of 6:2:1 of vodka:gin:vermouth. With the smooth crispness of the vodka, expect a heavily juniper cocktail, smooth enough for the vermouth’s flavours to come through. At a guess, it may have been City of London Distillery Gin (More on COLD Here), with the sweet tang of grapefruit. 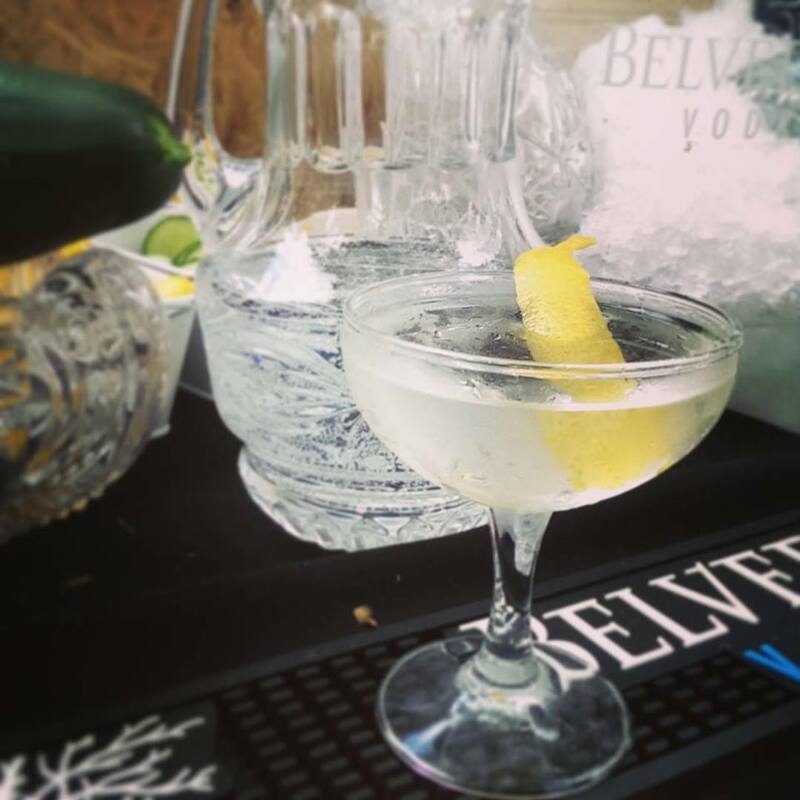 With an outdoor set up of their basement bar, the Rev brought out a comfy seating space under the sun, with a beautiful crystal stand, and a ‘Be a Martini’ multisensory experience that left you a bit stirred. With the wonderful Jim Wrigley and Joaquin Smith behind the bar, you can only expect the perfect Martini. 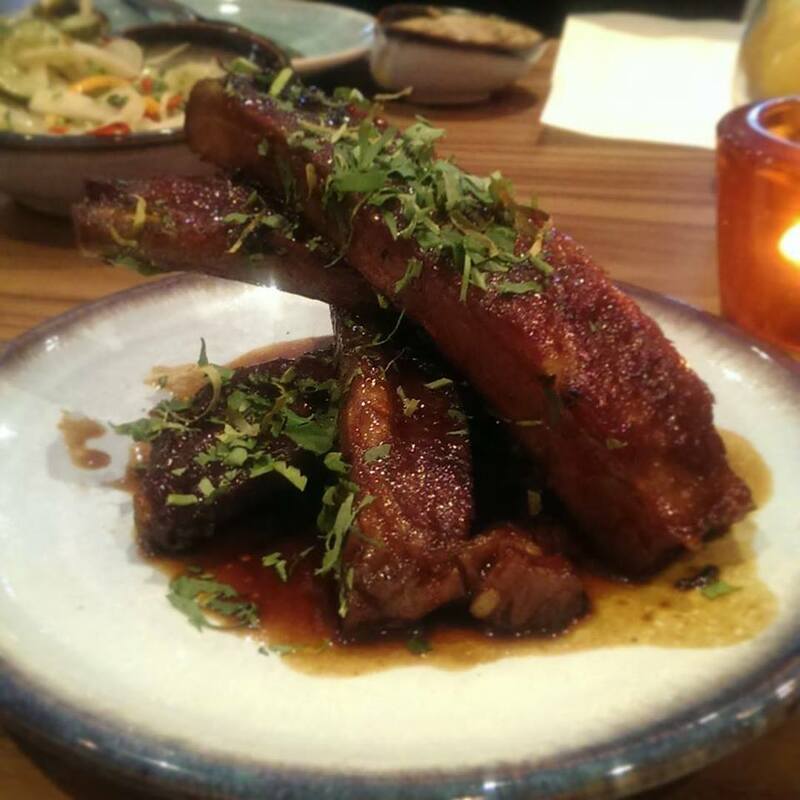 Only a couple of months into their career and the Fu Manchu (Click HERE for Review) is already readying their new Winter menu – and CitC got a preview! Presenting The Deception of Fu Manchu : Rye whiskey, Campari, homemade Raspberry and Vanilla shrub, lemon, grenadine, topped with Tsingtao beer foam. Not sure what to expect, the cocktail sounded like it would be a bit all over the place, but surprised with it’s lively flavours. The rye whiskey and Campari is exactly what the drink needed to balance the sweetness of the raspberry and vanilla shrub, and the beer foam has a powerful presence and effect of the palate of the cocktail (which, do not worry, tastes nothing like beer). The nose actually adds a refreshing tanginess to the experience, offsetting the raspberry and grenadine which manage the Campari, the rye whiskey maintaining a presence throughout the cocktail, ending neatly on the vanilla. 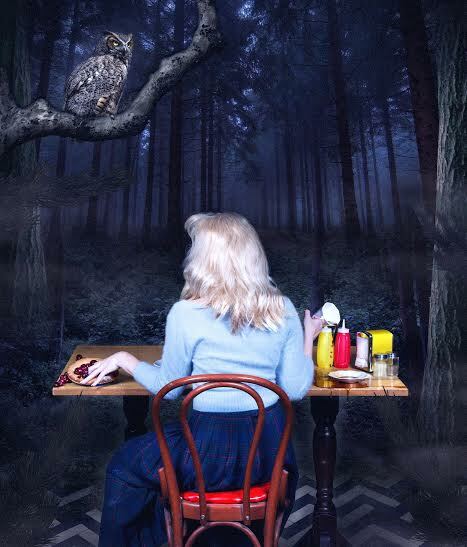 If this is what their next menu will be like, I’m looking forward to it. The stand itself may have been more suited to an indoor or nighttime event, with it’s deep reds and greens and golds. The host of ingredients were presented to the public alongside Tsingtao for those who’d rather have a beer, and customised fortune cookies containing a host of Fu Manchu vouchers, from a free cocktail to 20% off your bill! 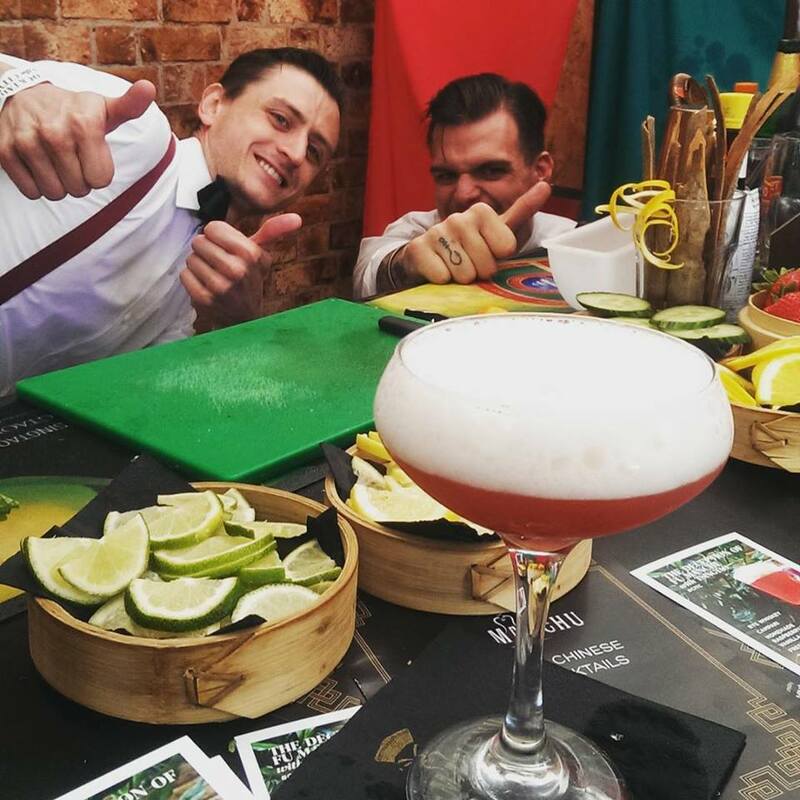 With their delightful barteam, this stall was another hit in the Hoodooist’s book. Brixton’s experimental Shrub and Shutter took the Whitley Neill Gin brand from last year’s PKD Bar (thankfully, nobody is ever in the mood for the PKD’s surprisingly racist menu and decor shenanigans) and presented the the Honey I Shrunk the Kids : Whitley Neill Gin, Zuidam Honey Whiskey, honey syrup, lemon, lavender bitters. The Bedford Square Gardens were perfect for this drink. Lavender and lime break in first, strengthened by the scent from the lavender garnish, and soon settle in with the honey that pairs so wonderfully with the warmer botanicals of the Whitley Neill. Tart to sweet, with hints of floral. The Far East by Coq d’Argent was probably the most snapped cocktail of the day: U’luvka Vodka with kaffir lime leaves and chilli, sochu with green tea, lemon, agave nectar, decorated with coloured spices and an edible flower. This cocktail deserves all the recognition it got. First, under the floral canopies of the beautiful stand, the drink seemed perfectly designed for the ‘Summer Edition’ of CitC. 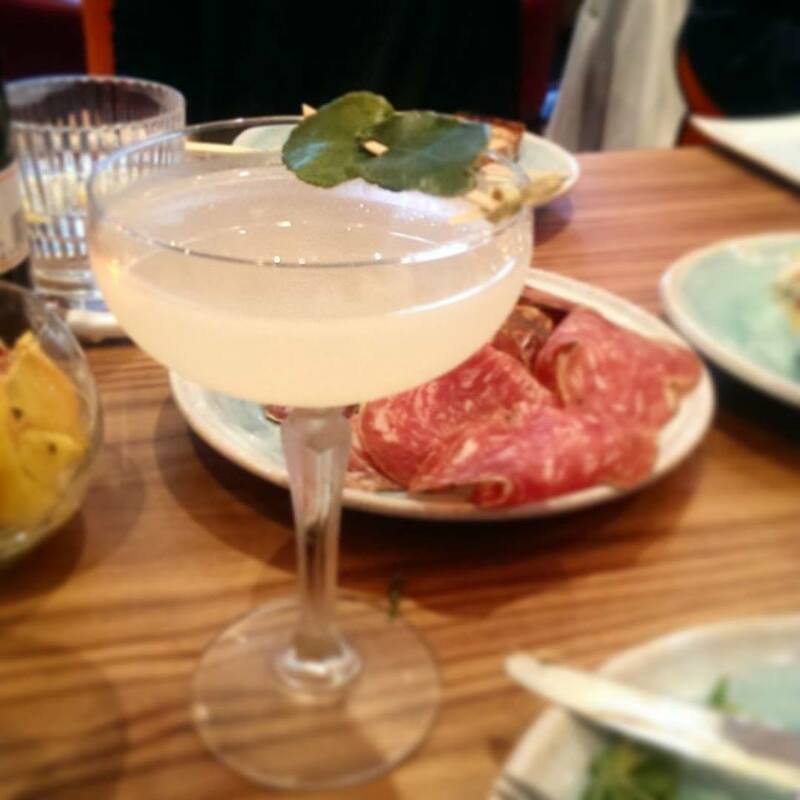 The cocktail strutted in with a rosey tartness of the kaffir lime leaves in the crystal crisp U’luvka, with background heavy weight of the sochu, lightened by the green tea’s herbaceousness (and something else…coriander? ), ending on a sweet note, with a lingering heat of the chilli infusion (more of a Tabasco heat) and dance of warm spice from the garnish. If this isn’t on their menu, it ought to be. Recently opened City basement bar Demon, Wise and Partners swaggered in with their Extra Aged Demon : Evan Williams Extra Aged Whiskey, Chocolate Absinthe Liqueur, Demon, Wise and Partners Bitters. 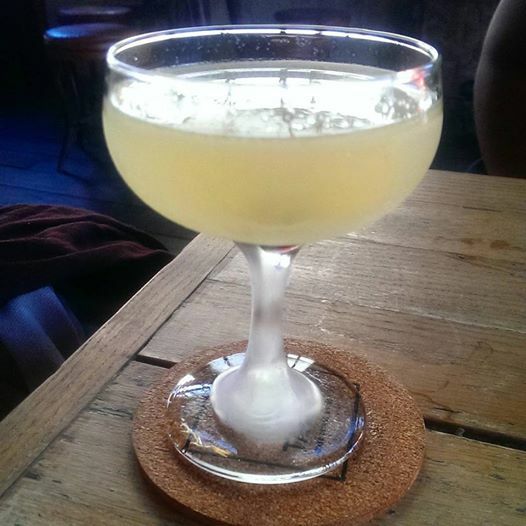 This cocktail just screams DWP, it is so reminiscent of their bar style, with focus on continental flavours less expressed here, bitter aniseed fascinations. Paired with cocoa dusted chocolate truffles, this bourbon muscles in with leather and brown sugar, accentuated by the chocolate, the absinthe liqueur kicking it down to size with some spice from the bitters. More of an indoor cocktail, but one we could relax with on the grass away from the crowd. 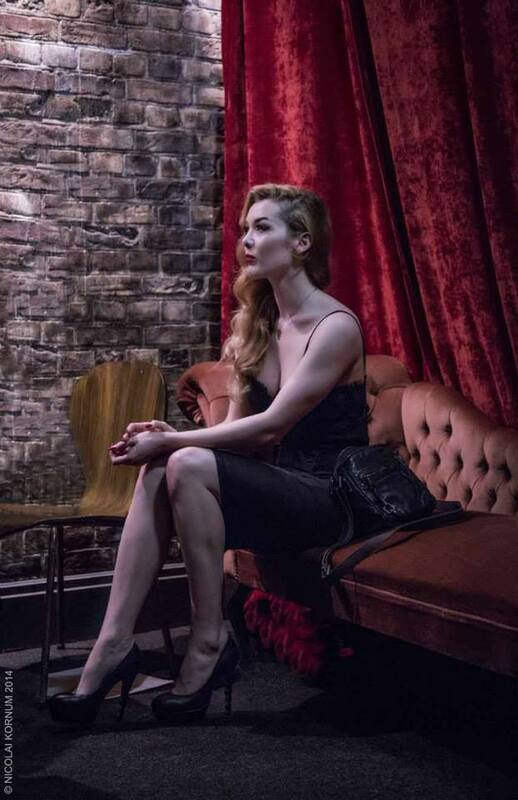 The Cocktail Trading Company (Click HERE for Review! 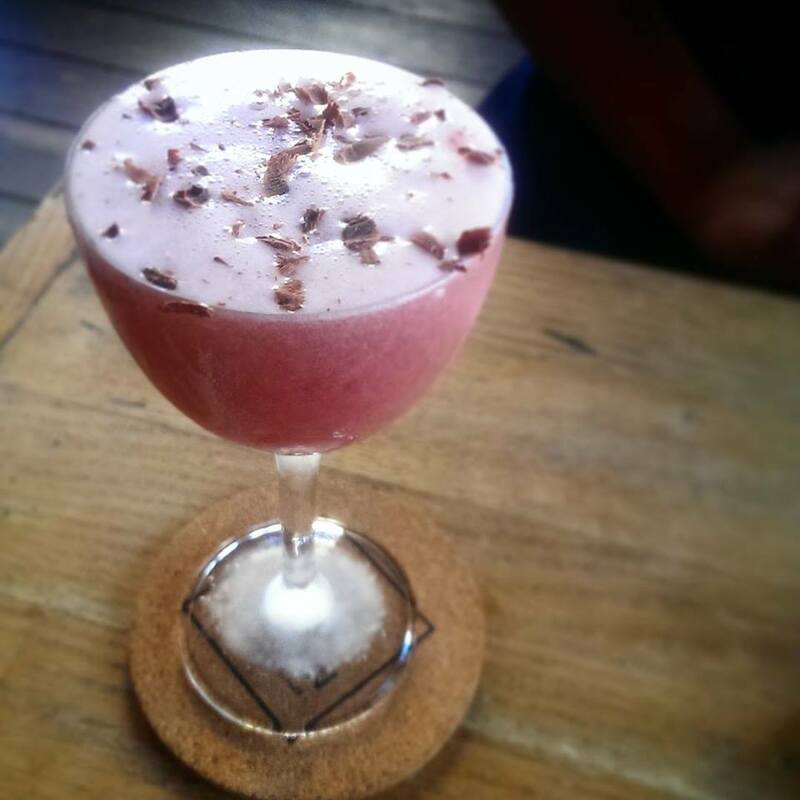 ), brought in the Blend It Like Peckham : Chambord, lemon sherbet, egg white, soda, milk. 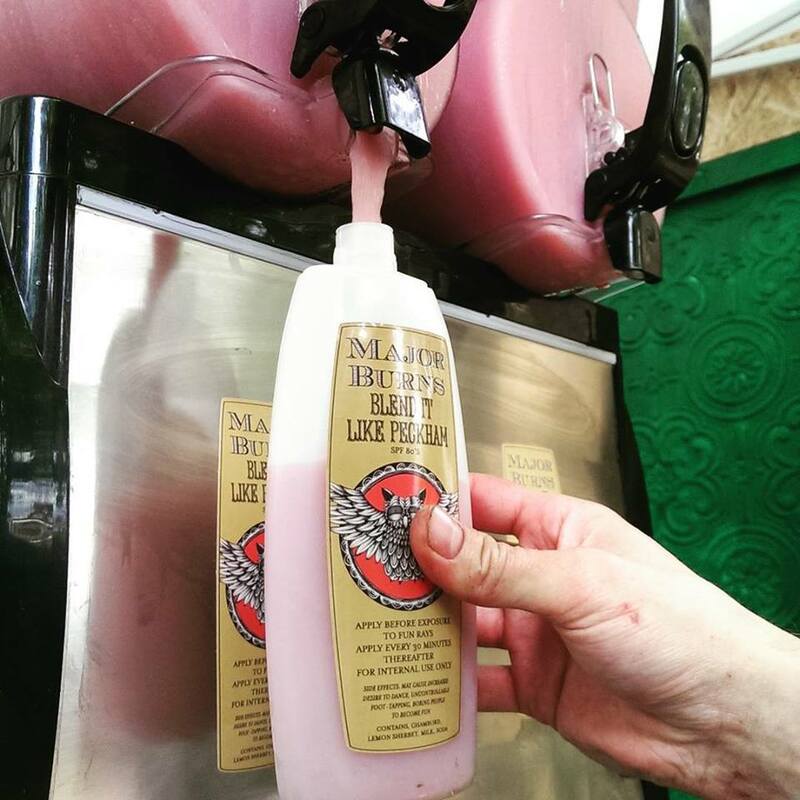 Served out of a slushie machine, the bright pink cocktail with it’s slurpy texture, obviously, had to be served in a shampoo bottle. Because why the hell not. The Major outdid themselves with a surprising drink, well balanced (even if you don’t have a sweet tooth) between the Chambord and lemon sherbet, and who knew how well soda and dairy work once put through a slushie machine? Meanwhile, Loves Company (Click HERE for Review! 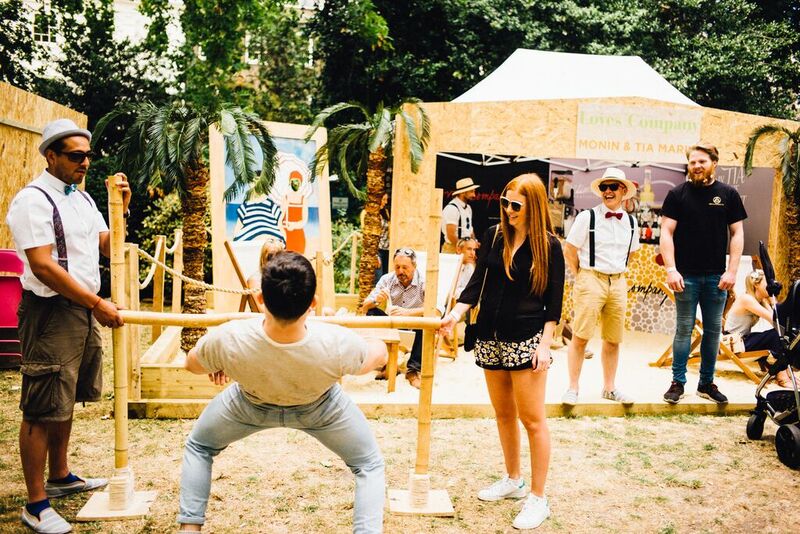 ), governed by the excellent Harry Gerakis, brought the beach to London; complete with sand, deckchairs, limbo competitions, ice creams and espresso martinis – now that’s one hell of a stand. It wasn’t just about the cocktails as each bar created its own particular experience, with an honorable mention going to Barrio Bars – runner up to Loves Company, who put on a silent disco as well as inviting guests to get crafty and decorate tiles that will soon adorn the walls of their new opening in Brixton. And that’s a wrap! 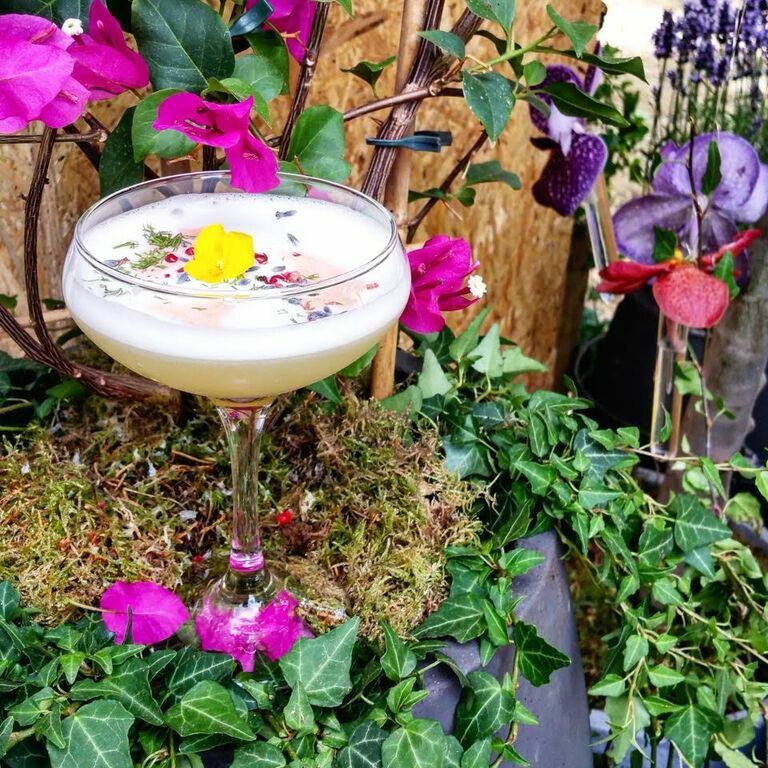 After such a successful Summer Edition, the question is, what will Cocktails in the City be creating for their next exciting installment? God knows I can’t wait till the next CitC. 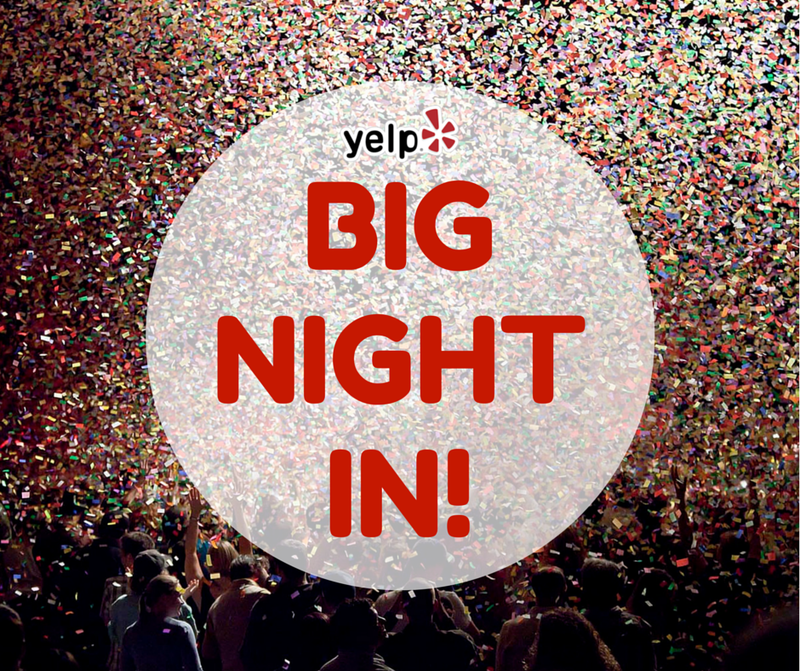 FREE GIVEAWAY: Yelp’s Big Night In! It’s a party at your place, and you’re the only one invited! 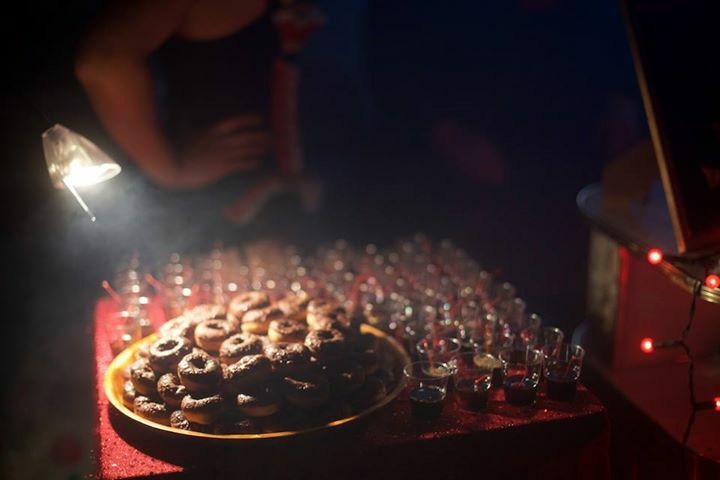 After the immensely successful VIP Ticket Giveaway on Highball Hoodoo to the excellent Yelp’s Mad Scientist Soirée (Review HERE) and the previous year’s Elite Summer Garden Party (Review HERE) – Yelp is back with something a little different! 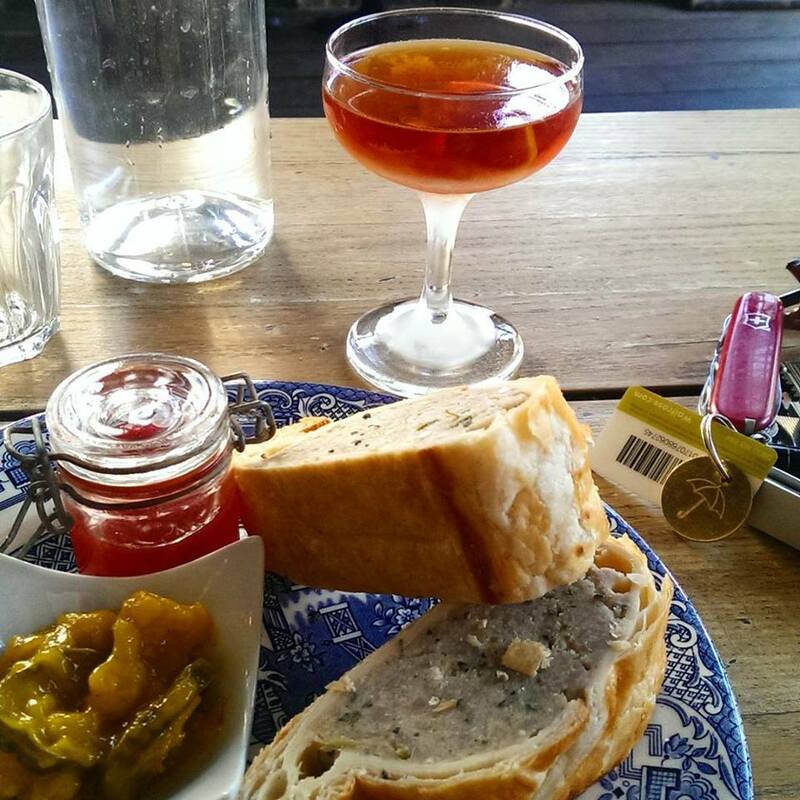 It’s time to treat yo’self (and you can do it with your trousers off.) Yes, on Friday, July 31st, we will be running the first ever YELP’S BIG NIGHT IN! Who wouldn’t want to be fed, pampered and taken care of, for free, all from your own home, in the comfort of your PJs! Free food delivered by Deliveroo! Free wine delivered by Mr. Vine! Free laundry picked up and delivered right to your door from Laundrapp! Your home beautifully cleaned by Hassle, for free! Anything you want, picked up and delivered by Quiqup! A service of your choice from Bizzby! We’d suggest free therapeutic massages, but if you need an errand run or want a personal trainer session before cracking into all that food, they can make that happen too! – Make sure you have an active Yelp profile (meaning photos or reviews added) in case we have an overabundance of RSVPs! – Check to make sure you’re free on Friday, 31st July, since the credit must be used on that date. – Only those with a real photo and name on their Yelp Profile will get a spot. – Again, if the event goes over capacity, those who are recently active on Yelp (meaning adding great REVIEWS, PICTURES or LISTS) will be given priority, so make sure you keep your Yelp Profile up to date with all the places you’ve been to lately! We’ll be choosing 30 winners next week to all participate on the same night. There’s never been a night in like this before and you know you would love to win a spot! 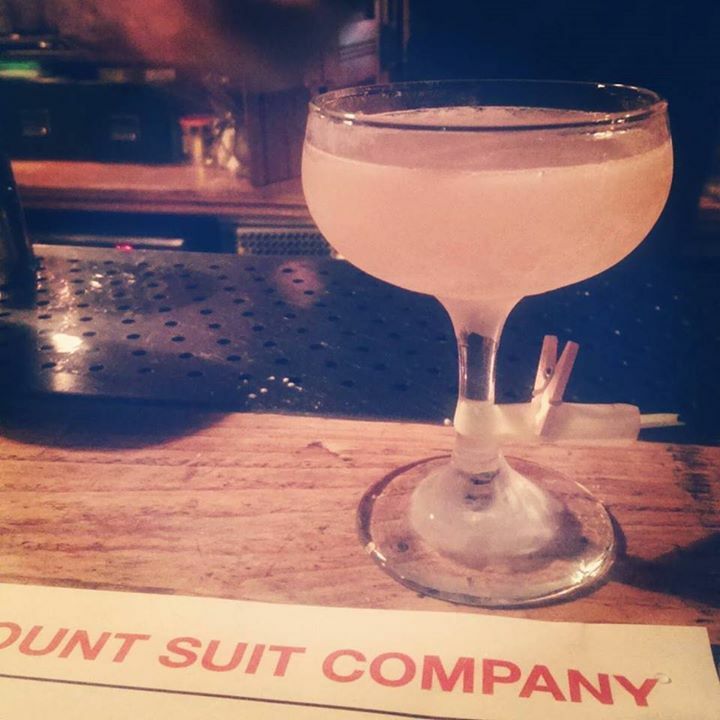 The street’s covered with clothing stores, and a discount suit store is hardly unique in these parts – except for one: The Discount Suit Company, housed in an ex-suit store basement, houses some of the more imaginative cocktails in the are. 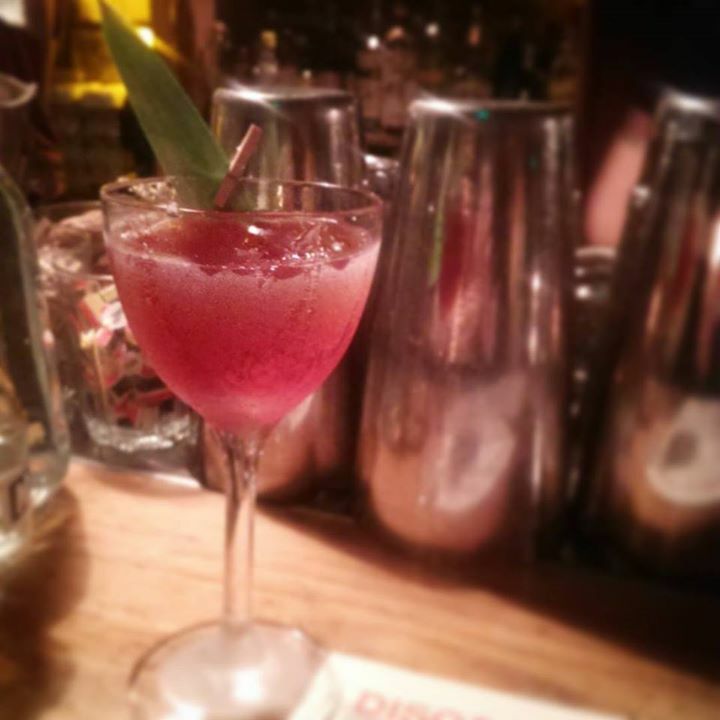 Run by the Umbrella Project (also responsible for the Sun Tavern, Bethnal Green – Review up Friday 17th July ’15! 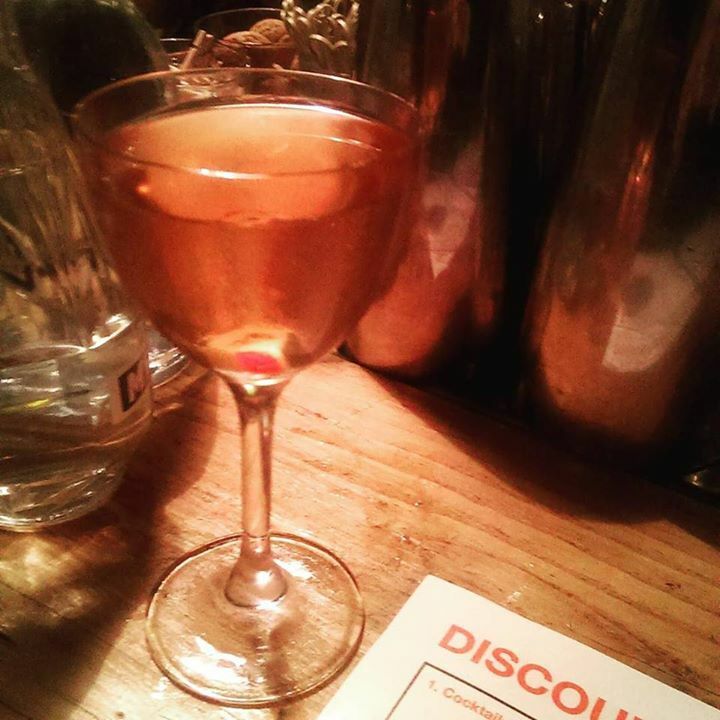 ), the DSC is a very intimate basement space, candlelit – though surprisingly loud – so I’d recommend booking a table in advance if you’d rather have a conversation down at the couch. Koffie? Wow, I’d love one of these every morning. 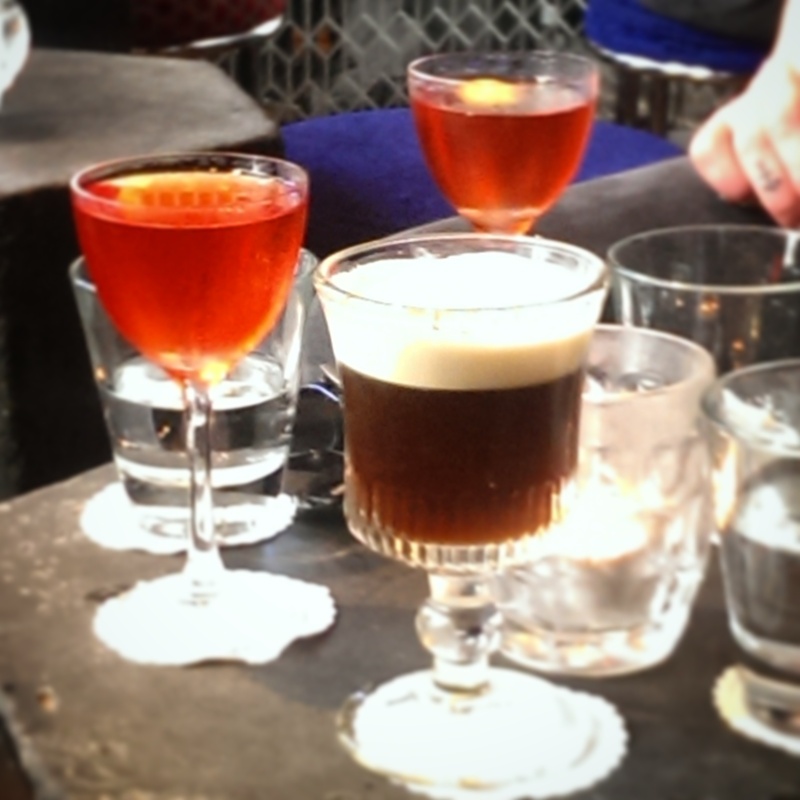 Genever, Ristretto liqueur, Fernet Branca, cold brew coffee, orgeat, egg yolk. Surprisingly light (you’d expect something heavier with the yolk, but the creaminess is not as thick as you’d think). 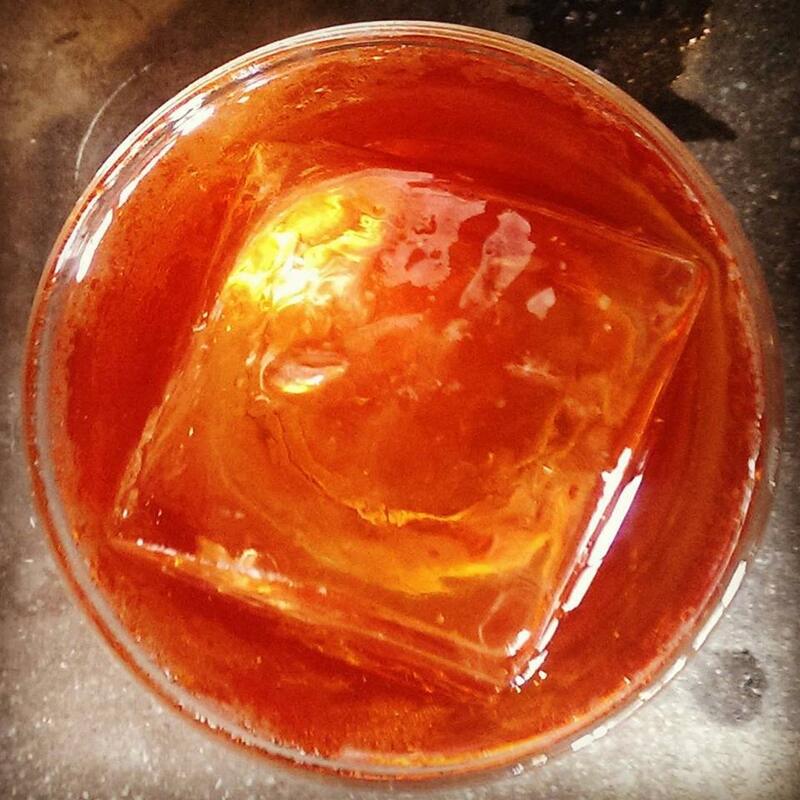 The bitter Fernet Branca is barely perceptible, just to help balance the sweetness of the ristretto liqueur and orgeat. 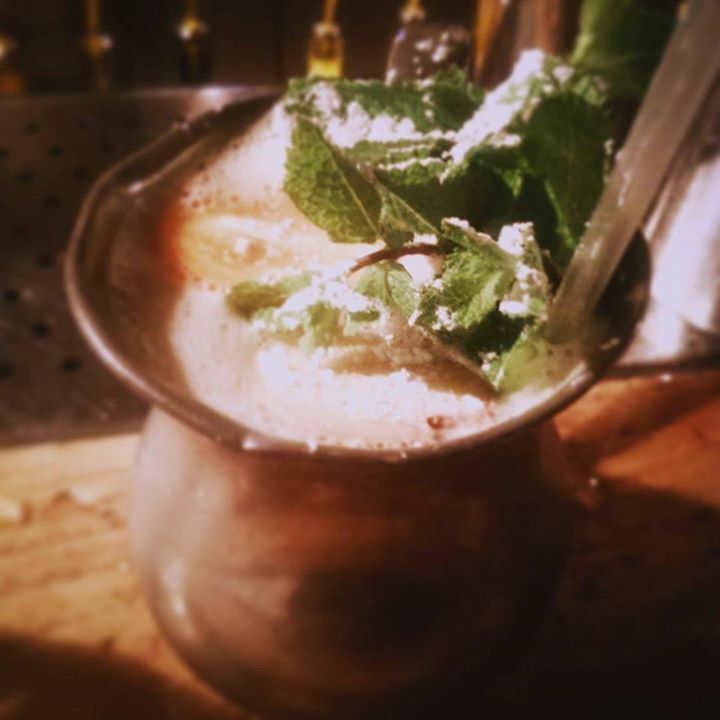 The almond in the orgeat works well with the bright floral notes of the Genever. Very short, but a beautiful drink. The bright green Pollo Loco is exactly what this summer asked for, Tequila Blanco, St. Germain, Absinthe, lemon, cucumber, honey water. Senses assaulted by waves of honey water and cucumber, the vegetal green of the cucumber tempered by the St. Germain – finally the tequila’s pepper and agave lingering underneath. All the while being a light summer cocktail. The Grapes and the Grain: Gin, Pisco, Velvet Falernum, grape juice, lime, honey water. Tropical without being tropical, this cocktail has pronounced flavours of the ginger, cloves and sweetness in Velvet Falernum, with the sweet honey water and a fruitiness that can only be ascribed to the grape juice. From underneath these the Pisco emerges, a light singe and more fruit. Another light summer drink, but lacks the same intensity of the Pollo Loco, and begins to lose character quickly – but a good way to end to a night of drinks with something cleansing and relaxed. 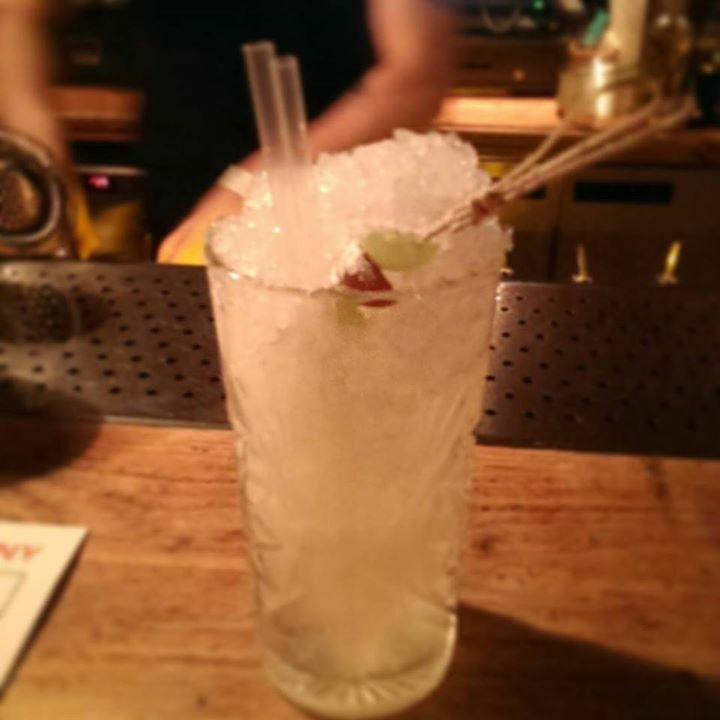 Next up, Bartender Connor’s favourite, the Dane-ted Love. Now we’re back in business: Akvavit, Amaro Montenegro, lemon juice, lemongrass syrup. The otherwise powerful rose notes of the Amaro Montenegro are surprisingly calm in this cocktail – instead the spice and fruit notes of the Amaro are lengthened by the lemon juice and akvavit, and the citrus drink is sweetened lightly by the lemongrass. On the topic of sweetness, The Royal Rhubarb goes all the way: Rhubarb vodka, cherry aperitif, vanilla syrup, rhubarb bitters, topped up with Prosecco. 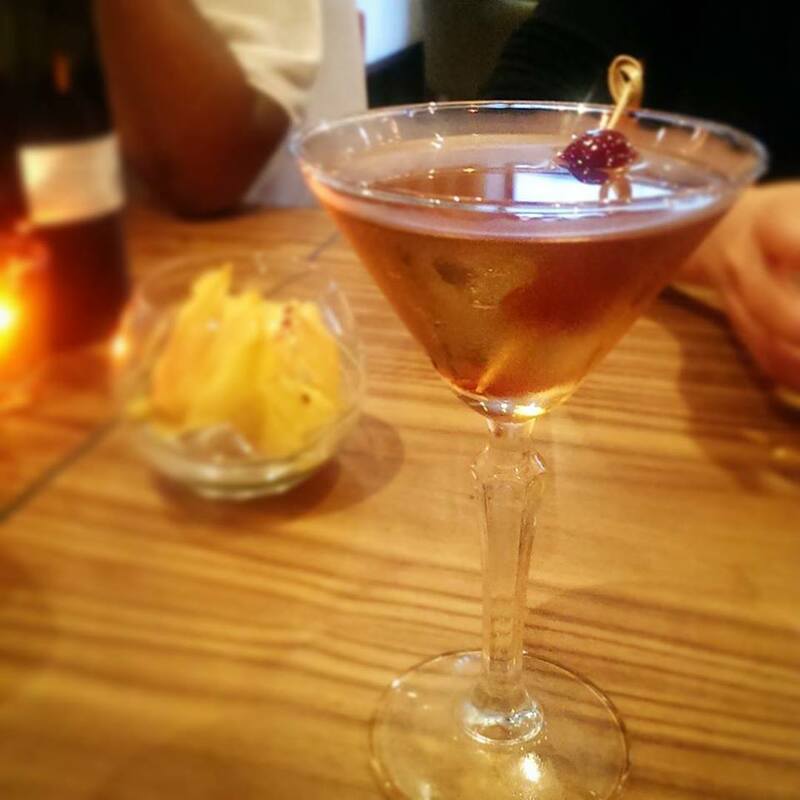 No surprise that it’s rhubarby – the cherry and the drier notes of the aperitif (gonna guess it’s Bold London Spirit? ), its clove and cassia, and the dry Prosecco, help round out the flavour of the cocktail by adding a little bit of oomph. 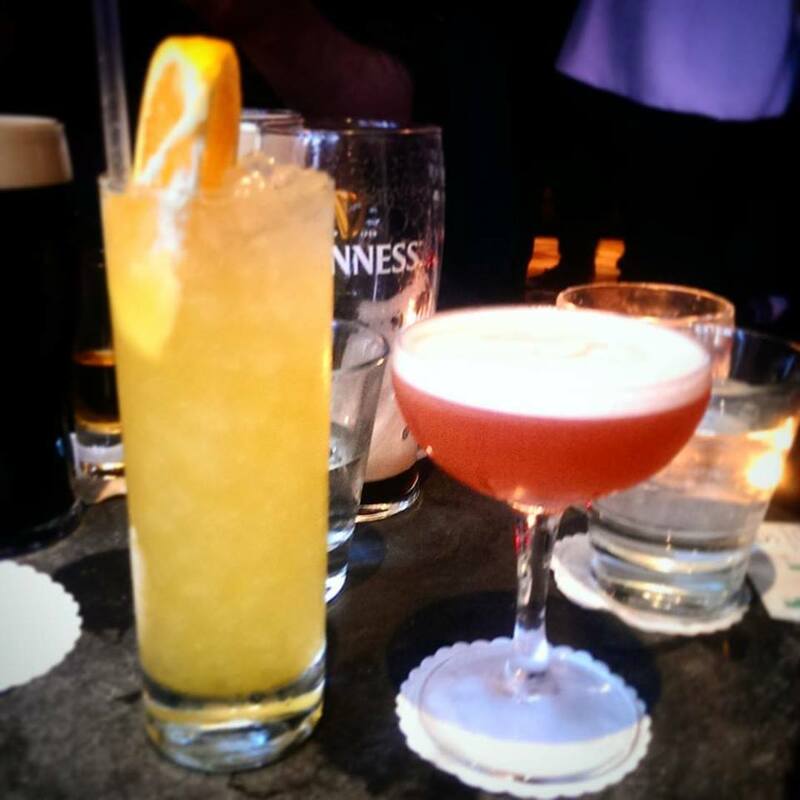 The Captain Cobbler, really, is the one drink the Hoodooist wouldn’t order again – Dark rum, Amontillado sherry, kumquat, ginger and honey marmalade, pink grapefruit and IPA head. I’m sure there is an audience who’d enjoy this, but it came off as a confused, sweet muddle. 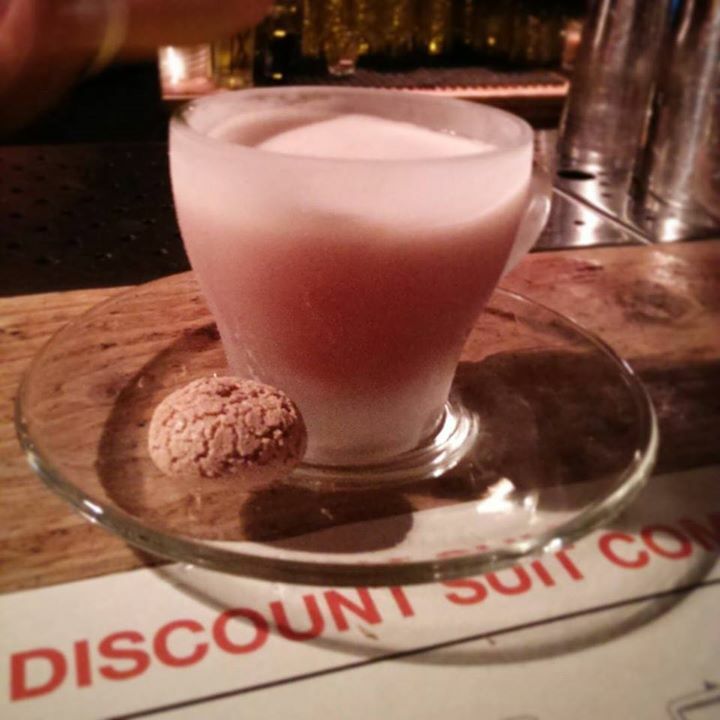 The Discount Suit Co.’s cocktail game is strong, as usual – fantastic in fact, for a short menu – and recognise that simplicity is key. 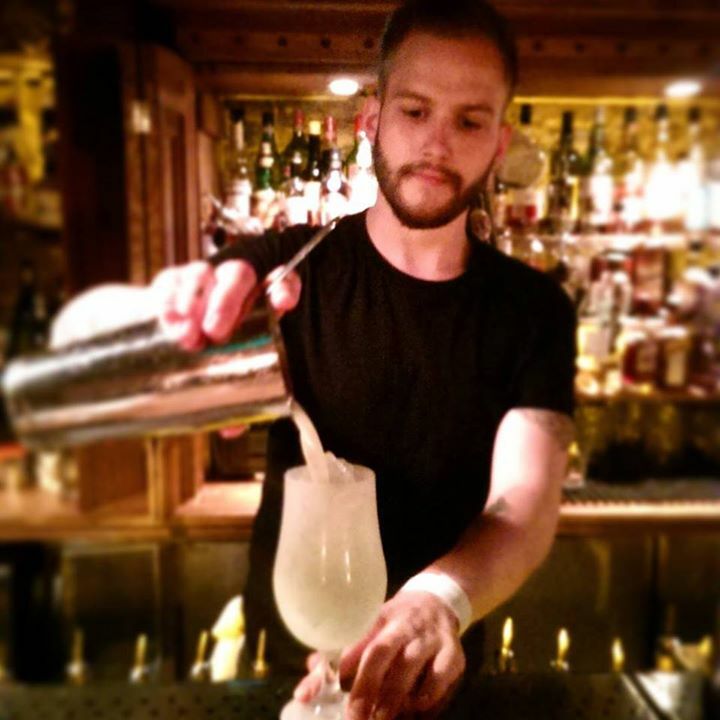 Of course, a short menu can be limiting, so whisky cocktails are gonna be classics ordered off menu – which shouldn’t be a problem with this fantastic team – fun, conversational, swift, gotta love the guys behind the bar. The Discount Suit Co. is another testament to the Umbrella Project’s skill at good bar concepts: aiming for simplicity, while understanding the customers and serving up quality at fabulous wallet-preserving costs (particularly handy close to the university as it is). Love this joint. 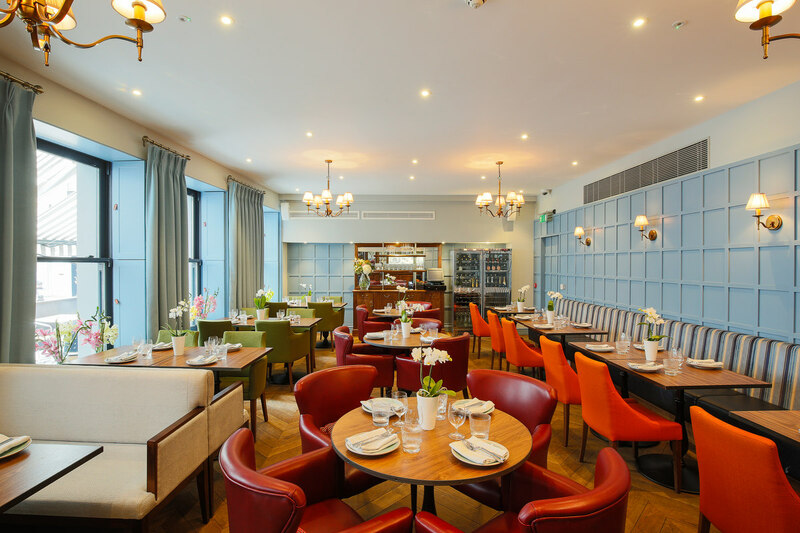 After last week’s visit of Conrad Algarve’s Wilson Pires to London (Click HERE for Review!) 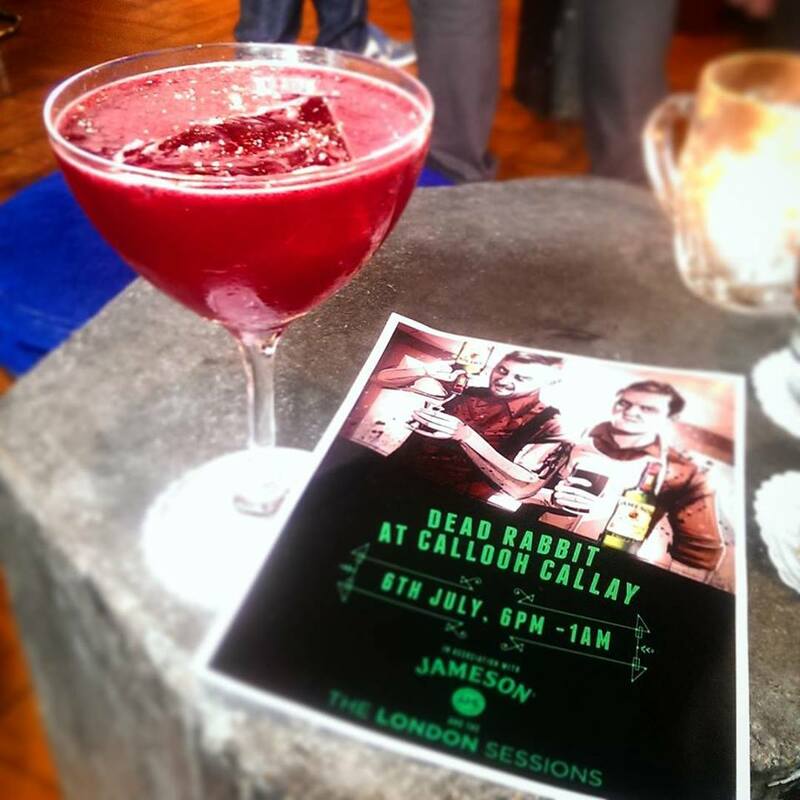 – this week brings the team from famed, multi-award-winning bar Dead Rabbit NYC to London’s Callooh Callay! Bringing with them a selection of cocktails from their own absolutely massive menu. 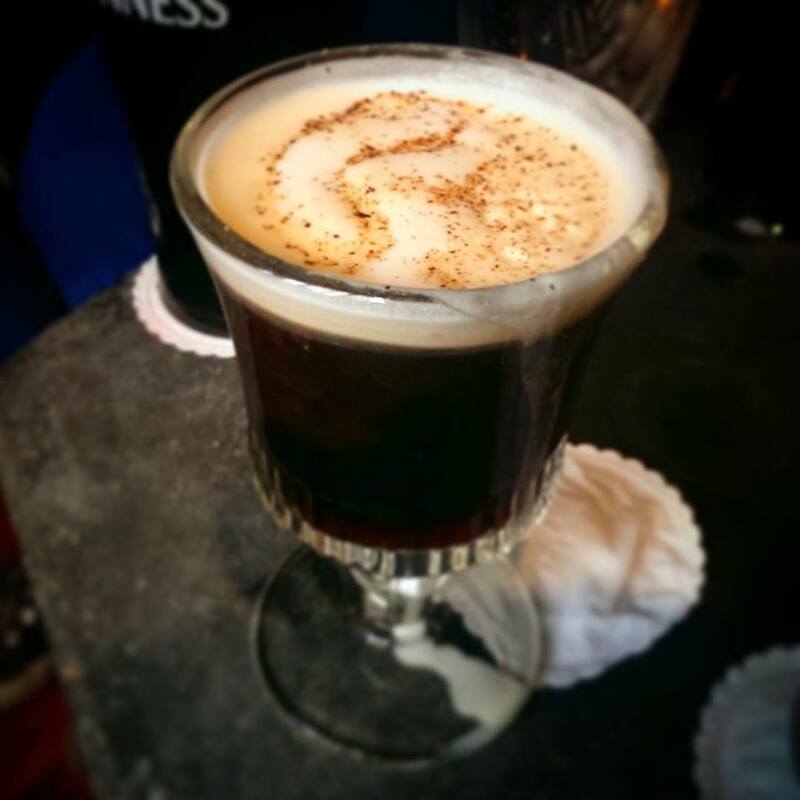 Dead Rabbit’s Irish Coffee, or, “Irish coffee? 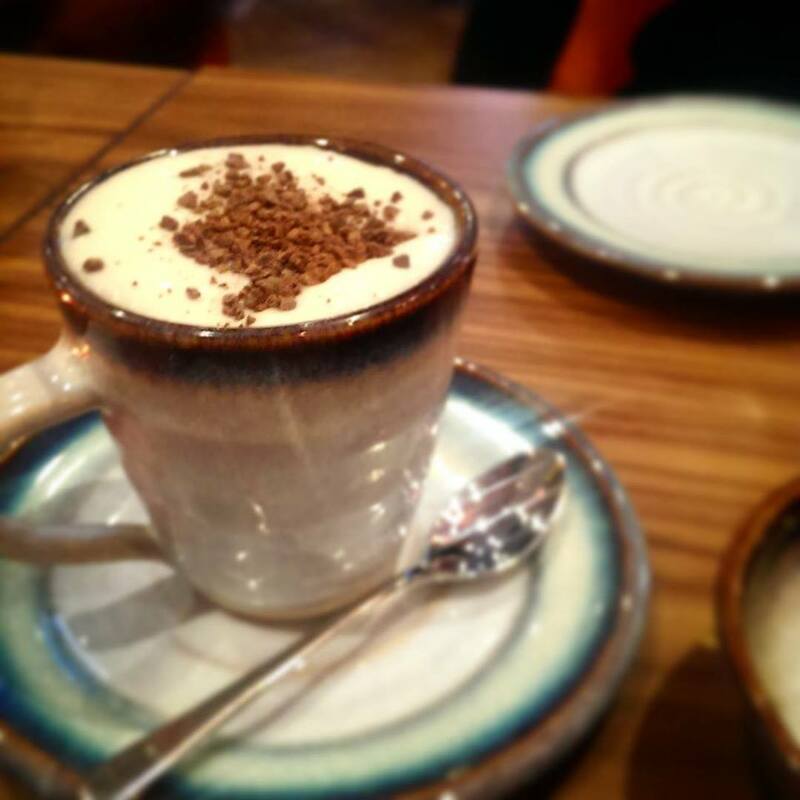 How good can an Irish Cof-holy s******** this is amazing” served hot: Powers Signature Release Irish Whiskey, Demerara, Coffee, Fresh Cream, Nutmeg – I do not know what unholy forces put this together, but it’s brilliant. The Demerara layer after the first kick of full-bodied coffee really seals the deal, ending with the lingering warmth of whiskey. Brilliant. The Buck the Trend brings Redbreast 15 year Single Pot Still Irish Whiskey, Usquebaugh Spice Blend, Meadowsweet Cordial, lemon, dandelion and burdock bitters together for a bright, floral, summer cocktail. The nose is full of honey, tropical fruits, citrus and floral notes, the palate is, well, for the lack of a better term, a ray of sunshine. Some of the Redbreast’s stewed fruits and toffee notes come through to add a depth to the sweet honeyed flavour of the meadowsweet cordial, and the zesty spices of the blend. Even the dandelion and burdock bitters play a part in securing that image of a summer field – perfect time of year for this cocktail. 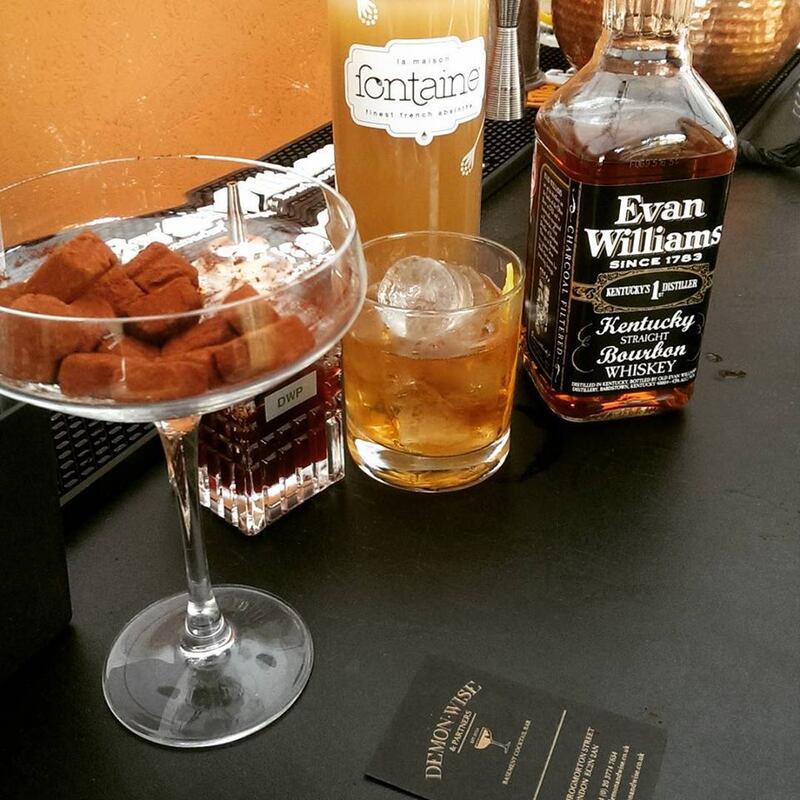 The Bán Voyage swaggers in with a totally different flavour profile. Nicknamed a ‘Whiskey Negroni’ at our table, it’s an exquisitely complex and sophisticated drink to sit back with – Yellow Spot Single Pot Still Irish Whiskey, Cocchi Americano, Bán Poitin, Luxardo Sangue Morlacco, St. Germain, Amer Picon, Dead Rabbit Orinoco bitters, Absinthe. The whiskey’s nose is most prominent, Yellow Spot’s stone fruits, a certain sherry-ness (probably enhanced by the Morlacco), but dry notes come through as well (possibly the Amer Picon and vermouth). The palate is smooth and long, the sweetness of marzipan accompanies the otherwise dry flavours. 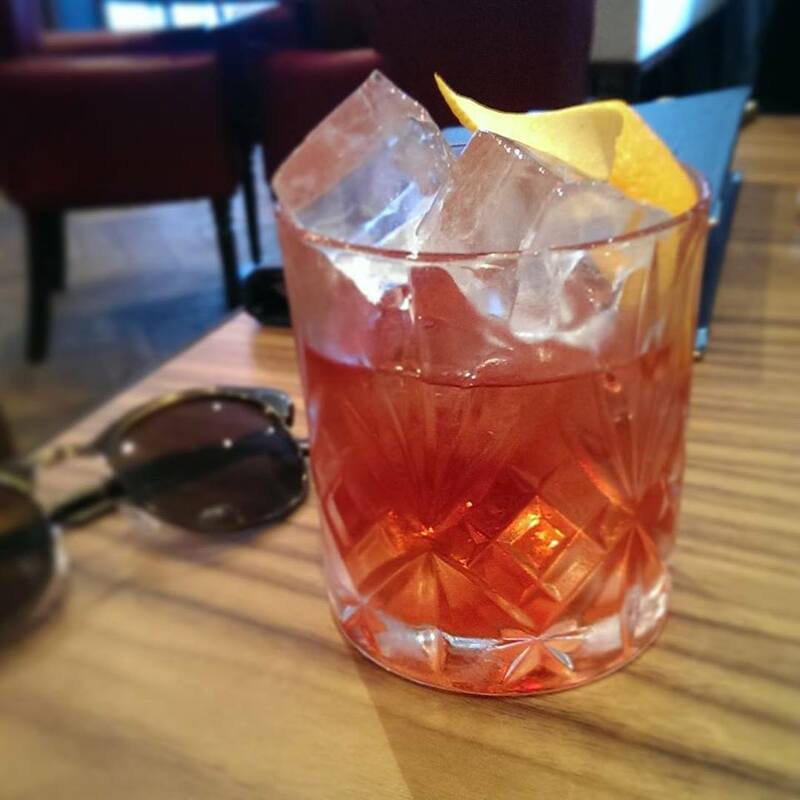 The tartness of the Morlacco brings the cherry flavours, but needs the Picon, Cocchi and Absinthe to temper its otherwise unholy sweetness. The Absinthe itself isn’t potent, but seems to play more as a cleansing aniseed right toward the end, like an afterthought. Strangely, the Hoodooist felt the Orinoco’s flavours the strongest: the heat-ridden bark spices from sandalwood to cinnamon, to raisins and bitter orange peels. A beautifully complex cocktail to ponder over. After that winner, the Ace King Jack kinda paled in comparison: Green Spot Single Pot Still Irish Whiskey, Calvados, Amer Picon, Yellow Chartreuse, Beetroot, lemon. It was difficult to get much out of this besides the overbearing sweetness of the beetroot paired with Calvados. Some of the herby notes of the whiskey came through, but I suppose one needs the sweeter drinks on the menu as well, but it felt one-dimensional. 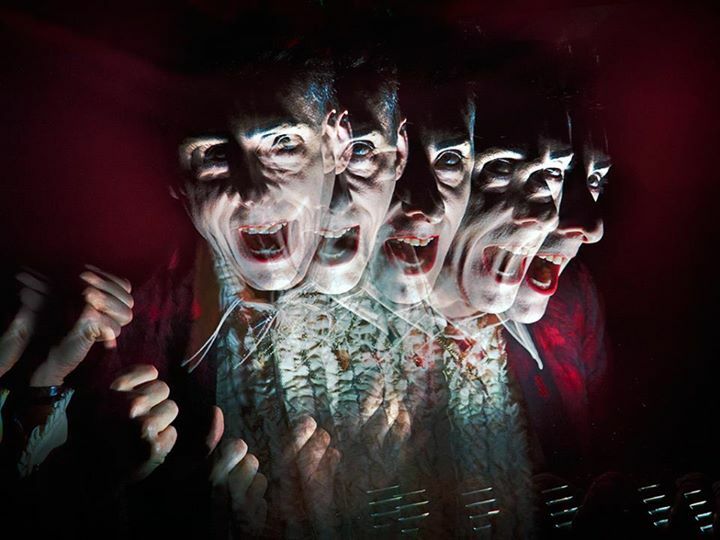 Similar to the Asylum Seeker (Jameson Black Barrel Irish Whiskey, Old Forester Bourbon, lime, coffee, chicory, pecan, absinthe), which may have been a slip of the hand, since at the table, it was difficult to taste much more than the absinthe. The Blackbirds is a very simple cocktail that accomplishes the job of quenching thirst in its simplicity: Jameson Original Irish Whiskey, Orange sherbet, Bergamot, Fever Tree soda. 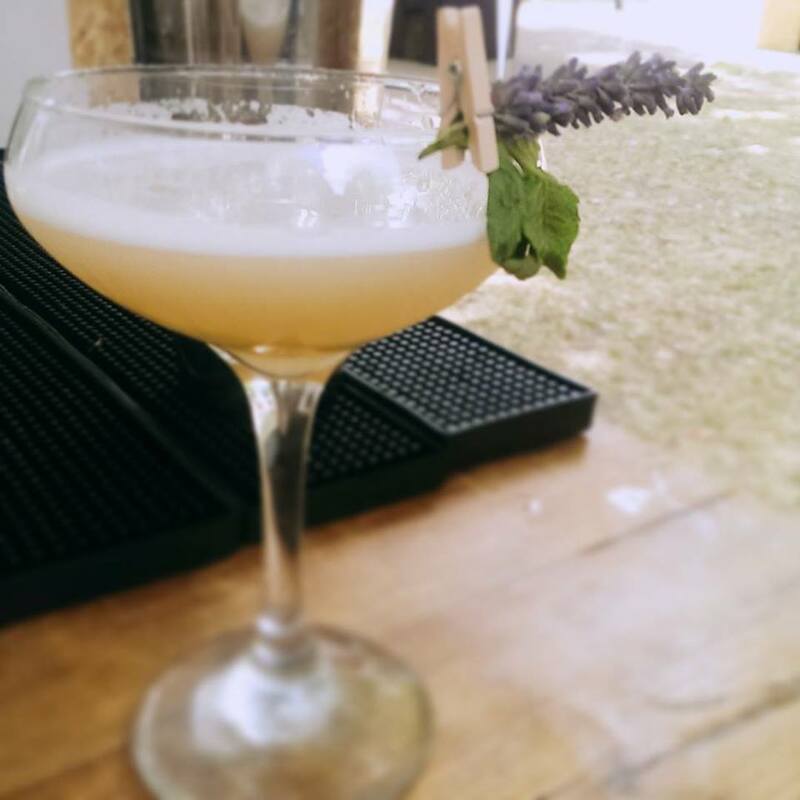 The bergamot, being such a fragile flavour, plays a much more subtly part in the entire cocktail, but you really need a patio for this drink. Easy to make at home for those heatwaves too. 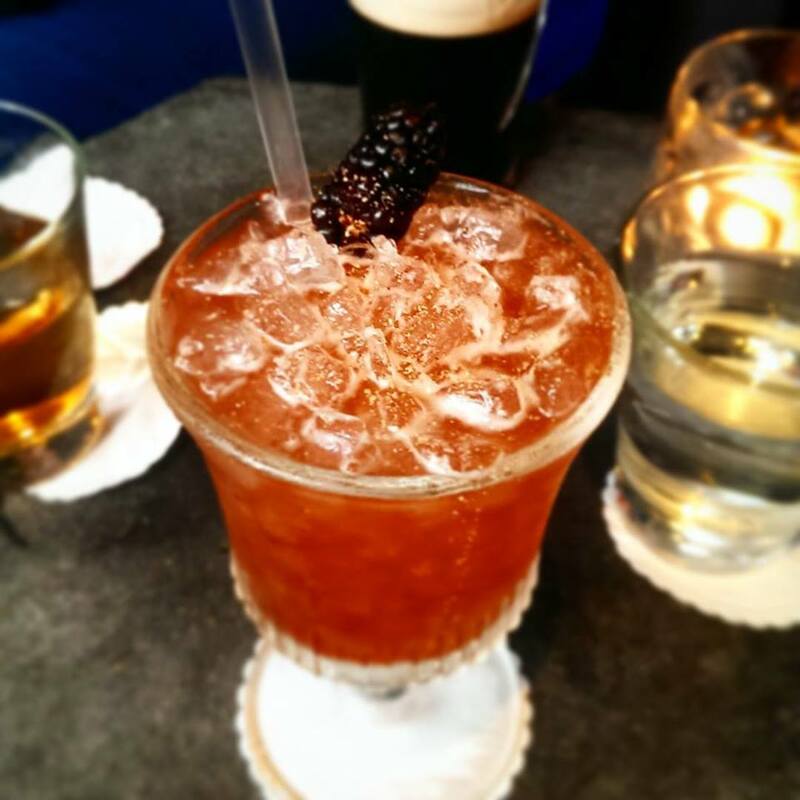 Finally, the Jay and Silent Bob – love this: Power John’s Lane Release Irish Whiskey, Crème de Framboise, Ancho Chilli, Cocchi Torino, Jerry Thomas Decant bitters. Bitter, but not too bitter; sweet, but not too sweet. Dry, but still with a sweet vermouth roundedness (probably from the sherry casks the whiskey was aged in) – striking a balance, probably that’s why the name. The strawberry and chilli are not powerful flavours here, but play their part in tempering the cocktail. 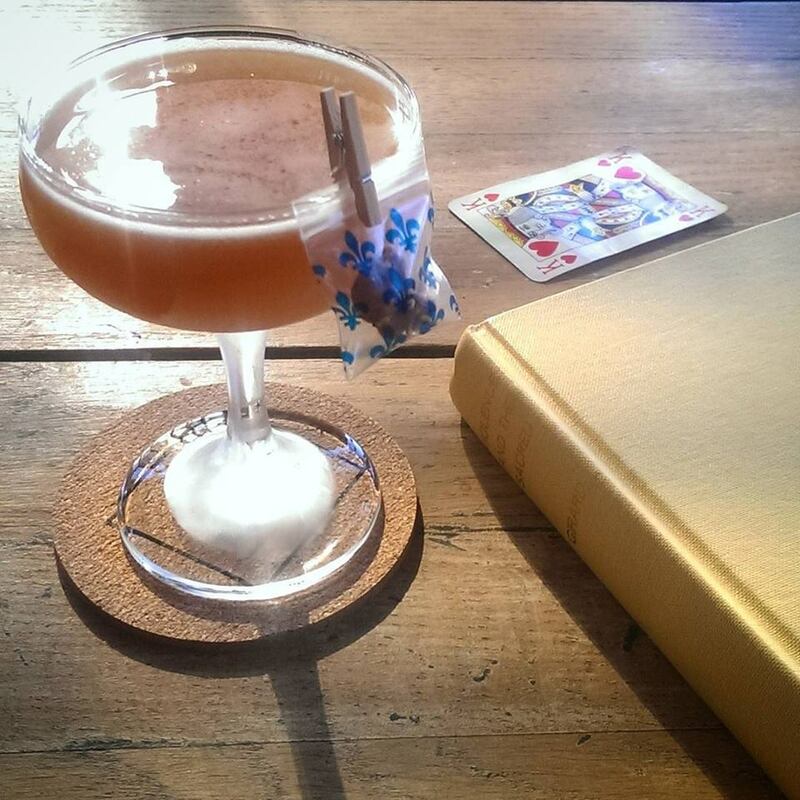 The Cocchi and whiskey work together wonderfully to make an aperitif to be proud of. Fruits, orange, cherries, balanced alongside vanilla, chocolate, raisins – finally ending with something cool, like menthol? Clean, cutting. Love. 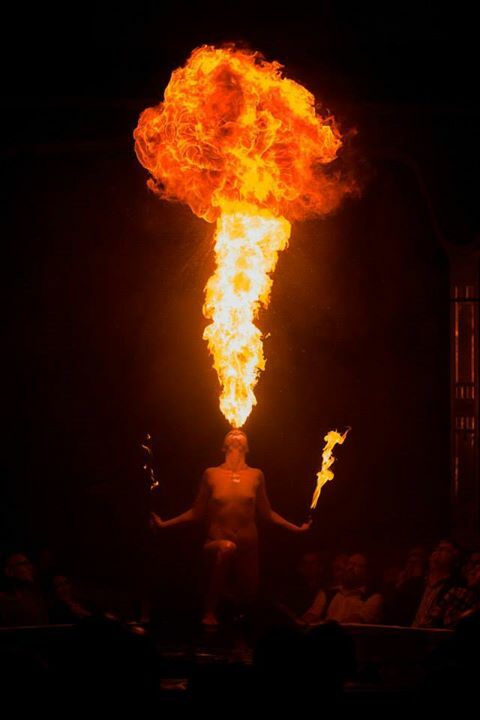 Dead Rabbit really knows how to put on a show. Coming down to Callooh Callay in London, they brought a taste of the cocktail scene in NYC, highlighting the distinct similarities and differences in the industry half a world apart, and of course, bringing their spectacular skill with them. If ever in NYC, you’d be mistaken to not visit.